K9AY Loops Wish you had enough room for an effective low-band receiving antenna? You do! This four-direction system fits in a 30-foot circle! Low-band operators are always looking for ways to improve their hearing. As a low-band fan, I was impressed with the EWE antenna developed by Floyd Koontz, WA2WVL. [1, 2] Koontz shows us how to build a compact, directional antenna—a design that quickly became very popular. But when I sat down at the computer to figure out the best way to install my own EWEs, a surprising new design emerged from my modeling experiments. Allow me to introduce you to the terminated loop, a concept that further shrinks the space required for a good receiving antenna without sacrificing performance! Figure 1 compares the real estate requirements of my four-direction loop system to that of an equivalent EWE array. The new system is not only smaller, it’s easier to install, needing only one support instead of five. Figure 1—A comparison of the real estate needed for four EWEs and the K9AY Loop system shows that the loops need only 1/7 the area of the EWEs, yet they provide the same directional patterns. The terminated loop (see Figure 2) is physically and electrically quite simple. It consists of a wire loop of any convenient shape (diamond, delta, etc), hung from a single support and with a ground rod at the bottom. A 9:1 impedance-matching transformer connects from one end of the loop to ground; a terminating resistor connects the other end of the loop to ground. This antenna is directional, favoring signals arriving from the feed point end, rejecting by several S units any signals arriving from the end connected to the terminating resistor, RTERM. Figure 2—The basic design of a single loop in an easy-to-construct quasi-delta loop configuration. Exchanging the feed point and termination reverses the pattern. A four-direction system uses two of these loops installed at right angles to one another (as shown in Figure 1) and a relay controlled switching system. To cover all directions, two loops using the same support are oriented at right angles to each other. Each loop provides reception from two directions when the feed point and termination are reversed, for a total of four separate patterns. Here are all the details you need to build the K9AY Loop antenna system, including a relay-controlled pattern-switching system that uses the coaxial feed line to carry the switching system control voltage. • Two lengths of wire about 85 feet each. Although almost any wire size will do, #14 copper is probably the best for a long-lasting installation. • Ten simple insulators—anything from old toothbrush handles to fancy porcelain insulators will do. • A three or four-foot length of copper pipe—the ground rod doesn’t need to be driven deeply—a depth of three to four feet is sufficient. Because copper-plated steel rods eventually rust, I prefer to use 1/2 or 3/4-inch-diameter copper water pipe. • One support 25 feet above ground—my antenna hangs from a limb of a Georgia Pine, but anything that gets the top of the loops up about 25 feet will work. The wooden A frame support described in The ARRL Handbook and Antenna Book is an excellent choice. A metal mast can be used, but make it only as long as necessary and insulate it from ground. Large metal objects affect the antenna’s performance, so install it in the clear. • You’ll also need some rope—nothing fancy, just something strong enough to keep things in place. Now, grab your tools and head for the backyard. Attach the midpoint of each wire length to an insulator that will be positioned at the top of the loop. The two loops must not touch each other, so leave some room between their insulators. I separated my insulators with about a foot of rope. Aligned directly under the tops of the loops, drive a ground rod, leaving a foot or so above ground as an attachment point. Using short ropes or wires, connect four insulators a few inches away from this post to receive the lower ends of the loops. Leave a foot of wire for a pigtail after twisting the ends of the loop wires around the insulators. Figure 3 sketches the important installation details, and the photo of Figure 4 shows how my system is installed. Figure 3—Construction details of a terminated loop, showing the base connections and corner supports of one of the loops. The relay box also houses the 9:1 matching transformer. Figure 4—A photo of the central connection point at the base of a two-loop system, as installed at K9AY. The lower corners of the loops are supported by insulators and ropes tied off to nearby trees, fence posts, or stakes driven into the ground. Pull out the corners with enough tension to maintain the loop shapes. At this point, the major mechanical work is finished and you should have something resembling an eggbeater, as shown in Figure 1. Figure 5 shows the relay circuit used to switch the feed and termination points of the loop wires. House the components in a weatherproof box having external connection points for the four ends of the loops, a coax connector for the feed line and a ground-wire attachment. Figure 5—Schematic of the relay box located at the base of the system. The relays switch between the two loops, reversing the feed point and termination connections. K1 is a DPDT relay that switches between the two loops. K2, another DPDT relay, swaps the connections of the terminating resistor and matching transformer, thereby reversing the pattern. Relay power is supplied via the coaxial feed line. C1 keeps the control voltage from reaching the antenna, and C2 provides an RF ground for the transformer. Most builders will likely choose to orient the loops for northeast/southwest and northwest/southeast directions. The relay box has four switching modes, one for each direction: 1) northeast, when neither relay is energized; 2) southeast, when K1 only is energized; 3) southwest, when K2 only is energized and 4) northwest, when both relays are energized. Switching is accomplished using a single power connection through steering diodes D1 and D2. D1 allows K1 to operate when +12 V is applied, while D2 blocks the voltage from reaching K2. When -12 V is applied, K2 operates, but not K1. When 12 V ac is applied, the diodes rectify it to operate both relays. The matching transformer is a 9:1 impedance, 3:1 turns ratio type that should be familiar to many readers. Five trifilar turns of ordinary hookup wire are wound on a 3/4 -inch-diameter (0.825 inch) 43 material toroid. The terminating resistor (RTERM) value will be between 390 to 560 W, depending on your band preference. With average ground conductivity, a value of 390 W provides the optimum F/B at 160 meters, while 560 W optimizes the loops for 80 meters. A value of 470 W splits the difference for “pretty good” performance on both bands. I chose to optimize the antenna for 160 meter operation, so used a 390 W resistor. Use an RTERM power rating of at least 1 W in case some transmitter power ends up being coupled to the loops. I use a 2-W carbon resistor, but two parallel 1/2-W or four 1/4-W units of appropriate ohmic value can also be substituted. Figure 6 is a diagram of the control box that is located in the shack. One 12 V ac transformer provides the ac relay power and feeds two half-wave rectifiers and filter capacitors to generate ±12 V. One SP4T switch selects the proper voltage to apply to the coax. The RF choke and 0.1 mF capacitor keep the RF and control voltage separated at the shack end. Figure 6—Schematic of the control box located in the shack. The control voltage to operate the relays is delivered via the coaxial line. Once the control unit and relay box are built and operating properly, mount the relay box at the ground rod and connect the four ends of the loops to their proper terminals. A length of 50 W coax carries the signal and power between the antenna and the switch box in the shack. I highly recommend keeping the coax on the ground (buried is better) to minimize pickup of noise or energy coupled from your transmit antenna. A receiving preamplifier is almost certainly needed, either your rig’s internal preamp or an external preamp. Next, verify that the antenna is working correctly. Some listening is probably what you’ll do first, but fading makes it almost impossible to determine the antenna’s actual performance. At best, you will be able to confirm that the antenna has reasonable directivity. More accurate listening tests can be performed several ways. The best way is to enlist the aid of a nearby ham whose station is very close to being in line with one of the two loops. If such help is not available, the next-best option is to identify a local AM radio station high in the band (1400-1600 kHz) and use that as your test signal. Switch the loops to their various directions. If the test station is directly in line with one loop, you should see a front-to-back (F/B) ratio of about 2 to 3 S units as the antenna is switched toward and away from the station. You won’t see a huge F/B because the deepest null is up at 30 to 40°. Local ground conductivity can affect performance. You might not get an optimum pattern at your particular location with the “normal-value” terminating resistor. If you aren’t getting the expected performance, substitute a 1 kW potentiometer for the terminating resistor and adjust it for best F/B while listening to your test station. Then, measure the pot’s resistance and install a fixed-value resistor of the same value. The vertical pattern of the antenna, in line with the loop, is shown in Figure 7. Figure 8 is the azimuth pattern at 30° elevation. Modeling was done using W7EL’s EZNEC program, which uses NEC-2 to evaluate the antenna over “real” ground. [3, 4] Listening tests confirm that these modeled patterns are close to the as-built antenna performance. Much of the on-air pattern evaluation was done by listening to AM broadcast stations and to WWV on 2.5 MHz, because the pattern of the antenna changes little over this frequency range. Stations at exactly the right distance and directions have verified the deep null off the back. For example, New York City area radio stations are exactly in line with my northeast/southwest loop, and show 40 dB F/B ratio when the arrival angle is just right! Figure 7—Vertical radiation pattern of the loops along the plane of the loop. Figure 8—Horizontal radiation pattern of the loops at 30° elevation. The front of the pattern is quite broad, with maybe one S unit F/S. The advantage of this antenna is its rearward null, which reduces local noise and distant QRM. I installed my system just 21/2 weeks before the 1996 ARRL 160 Meter Contest, so it got a thorough evaluation in a short time. During the contest, changing the pattern direction often made the difference between Q5 copy and a busted contact. For example, pointing southeast to hear Caribbean stations reduced stateside QRM by 2 or 3 S units, enough to easily hear the DX through unruly pileups. The compact size of the K9AY Loop makes it easy to build more than one for a multielement array. Installing two of them in a broadside/endfire combination is one option, but a really ambitious approach would be to install a four-square! This array would have a substantial F/B over a wide angle, along with a much narrower front lobe than a single loop. The space required for this high-performance array is far less than what is needed for Beverages. If you try this, remember to switch the individual loops to the desired direction as you switch the feed system. If you want improved reception on the low bands and don’t have a lot of room, the terminated loop is an excellent choice. It is small, easy to build and its directional pattern makes DX much easier to hear. 1Floyd Koontz, WA2WVL, “Is This Ewe for You?” QST, Feb 1995, pp 31-33. 3EZNEC 1.0 by Roy Lewallen, W7EL, PO Box 6658, Beaverton, OR 97007; tel: 503-646-2885, fax: 503-671-9046. 4The modeling accuracy of antennas with a direct connection to ground is somewhat uncertain, even with the power of NEC-2. The high accuracy ground characterization of the Sommerfield method gives answers that vary with the number of segments chosen for each wire. The MININEC-type ground model gives more consistent results, but on-air tests show that the deepest null is obtained with a lower value terminating resistor than this model indicates. The plots presented here are the “best fit” between modeled and observed performance. Gary Breed has been a ham since the age of 12, and has held the call sign K9AY since 1976. He enjoys contesting, DXing, “homebrewing,” QRP operating and, of course, experimenting with antennas. Gary holds a patent for a multifrequency antenna technique and has provided antennas for the AH1A, 9G1XA, 3Y0PI, V5/ZS6YG and ZL8RI DXpeditions. You can contact Gary at 501 Swanson Dr, Lawrenceville, GA 30243, e-mail editor@noblepub.com. Photos by the author. How Does the Terminated Loop Work? The terminated loop was developed after examining the behavior of the EWE. In theory, the EWE is a terminated half-loop. High-frequency directional couplers such as those used in the well-known Bird Thruline wattmeters are constructed similarly, just much smaller. * My analysis determined that a terminated full loop, fed and terminated to a single ground point at bottom center, behaves the same way as a half loop. How does a single loop achieve a directional pattern? By the way it responds to the electric (E) and magnetic (H) field components of the arriving electromagnetic wave. Let’s say we have a signal arriving at the loop from one end. As the wave passes, the loop’s wire intercepts the E-field like a short vertical antenna, creating a voltage at the feed point. As expected from a vertical, the E-field response is omni-directional. The magnetic field works differently. The H field is at right angles to the E field and induces a current as it passes through the loop. The voltage developed across the terminating resistor by that current is combined with the E-field voltage. If the wave arrives from the feed point end, the voltages add in phase. If the wave arrives from the opposite direction, the voltage is 180° out of phase with (and subtracted from) the E-field voltage. To maximize the front-to-back ratio, the terminating resistor must have a value that balances the voltages created by the two field components so that their sum is close to zero. The resulting pattern is a cardioid with a single null. With an optimum terminating resistor, the null can reach 40 dB or more in depth—that’s more than six S units! The null is not at ground level, but at 20 to 55° elevation, depending on the shape of the loop and local ground conditions. Unless you build a short, wide loop or a tall, skinny loop, the null will be at 30 to 40° elevation, very convenient for reducing QRM from in-country stations. Ground is an essential part of the antenna—its resistance is part of the circuit. 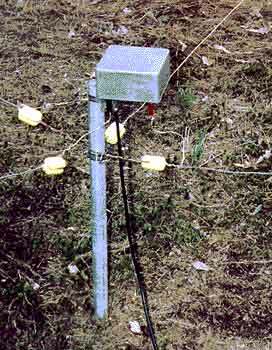 If ground conductivity is known at your location, it can be included in the computer modeling parameters. However, ground conditions can change over a short distance and vary with seasonal changes and moisture content. If you find that the antenna does not perform as modeled, adjustment of the terminating resistor value may be needed, as noted in the article. *Instruction Book, Model 43 Wattmeter, Bird Electronic Corp, Solon, OH. · Like all antennas, this one can be affected by nearby metallic objects or structures. Do your best to keep the antenna in the clear, away from your tower, house and power lines. · Noise reduction in this antenna is achieved mainly by the directional pattern, although being grounded offers some reduction of wind, rain and snow static. Compared to the typical omnidirectional vertical or low inverted V, the reduction in overall noise and interference can be dramatic. · The maximum circumference of the loop is a little over 1/4 l at the highest frequency of operation. If the loop is larger, the E and H-field responses of the antenna can no longer be balanced. Smaller loops (or same-size loops at lower frequencies) retain the directional pattern, which makes this an excellent antenna for AM broadcast reception. Unfortunately, the received signal voltage is proportional to the area enclosed by the loop, so sensitivity decreases rapidly as the antenna becomes smaller. Unless you have a very good preamp, keep the loop sizes near the maximum. • I enjoyed the article on the crossed terminated loop array by Gary Breed, K9AY, and I thought others may be interested in the origin of the terminated loop element used in the array. It is none other than H. H. Beverage! Beverage’s patent on this antenna was issued long after his publication of the much more widely known Beverage Wave Antenna. The loop is definitely not a wave antenna, as pointed out in Breed’s article and in the Beverage patent. Its operation depends on making the loop diameter "somewhat less than a half the length of the operating wave". The other key difference between the two Beverage antennas is that the wave antenna receives best when the wave travels from the terminated end toward the receiver end, while the terminated loop receives best when the wave travels from the receiver end toward the termination. Beverage’s patent describes the full terminated loop, while Breed’s version is essentially half a loop, reflected in the ground. The evolution of one to the other is easily seen: Start with a full circular loop, with the feed line connected across a break in the loop (just as an ordinary small magnetic dipole antenna), and a terminating resistor connected across another break in the circle diametrically opposite the feed line. Then, make a cut along this same diameter, keeping half the circle, with the other half being replaced by its image in an ideal ground plane. To allow convenient switching of the feed line and terminating resistor, move them to the center of the semicircle, connecting them to the loop by short wires above the ground plane (feed lines). This is similar to the scheme used to switch directions in rhombic antennas. Breed further tilts these wire feeders to link up with the side support guys. Incidentally, in his patent, Beverage states that the loop can be any shape, giving examples of a circle, a rectangle and a diamond (Breed’s version), as long as the dimensions are less than a half wave. Beverage’s patent description of how his antenna works is more confusing (to me) than Breed’s description in terms of the superposition of a magnetic dipole (Rterm = 0) and an electric dipole (Rterm = infinity, with arms distorted into a circle). Both terminations result in a roughly figure 8 pattern, but the relative phases of the loops in the 8 are different, so that in the superposition, they tend to cancel in one direction and add in the opposite direction. The relative contributions from the two superposed antennas depends on the value of Rterm, and can be adjusted for best cancellation. My colleague at Caltech, Dave Rutledge, KN6EK, and I independently came to this same description. Beverage states that Rterm "may have a value of 700 ohms" for the sample dimensions he gives, employing the usual vagueness that inventors like to adopt in citing actual numbers in patents. A feature of the antenna noted by Gibson and Wilson—and one designed into their version—is that the termination giving the deepest null in the cardioid pattern is not a pure resistance, but has a reactive component. I verified this for myself using EZNEC, and also observed that for the R+jX termination giving the deepest null, the feed-point impedance is R–jX. I have no explanation for this, but it was true with all the dimensions I used in modeling. In Gary Breed’s version, both termination and feed-point impedances will be modified somewhat by the short transmission lines connecting the outer edge of the loop and the terminals. However, anyone building this antenna should experiment with variable reactance as well as variable resistance to get the best front-to-back ratio. Breed states that the ground conditions will play an important role in the operation of the antenna, and I certainly agree. A perfectly conducting ground plane under the loop would help a lot. With a simple, short vertical antenna, radial wires do the job nicely, because the near-field return currents are all radial. However, here the situation is more complicated. In this case, the antenna is both a bent-over electric vertical, and a half-loop magnetic dipole. The return currents are definitely not just radial, so that simple radial wires will not properly substitute for an ideal ground plane. I do not know what shape such wires ought to be, but they will be complicated! One way to get around the ground condition problem would be to use this loop as Beverage originally described, that is, as a horizontal loop. The directional switching might be accomplished by putting four gaps 90° apart in the loop, and running transmission lines from the four gaps to the center of the loop, where switching of the load, the termination and two shorts would electrically rotate the pattern in four directions. I haven’t tried this configuration in modeling or in fact yet (I currently live in a condo with a "no antennas" restriction), so someone else can pioneer this version of "Beverage’s Other Antenna." Letters for this column may be sent to Technical Correspondence, ARRL, 225 Main St, Newington, CT 06111, or via e-mail to ppagel@arrl.org. Please include your name, call sign, complete mailing address, daytime telephone number and e-mail address on all correspondence. Whether praising or criticizing a work, please send the author(s) a copy of your comments. The publishers of QST assume no responsibility for statements made herein by correspondents. I am pleased to report that many hams have successfully built the receiving antenna described in the September 1997 issue of QST. I had some concern that variations in local ground conditions and nearby structures could reduce the antenna’s performance, but the performance I obtained seems to be readily duplicated. There is one problem that needs to be addressed. When the loops are switched to the northwest direction, an ac voltage is sent down the coax to the relay box. A few hams have reported hum or distortion when the antenna is switched in this direction. Two explanations are possible: a ground loop due to widely separated antenna and station grounds, or modulation of the core of the matching transformer. The presence of hum was not evident in my prototype, but to avoid either cause of the problem, I recommend using a separate three-conductor control wire to operate the relays. The power is solely 12 V dc, and no current flows through the transformer. The modifications are shown in the accompanying figures, which can replace Figures 5 and 6 in the original article. Figure 1—A revision of the schematic shown in Figure 5 of the September 1997 QST article. Figure 2—Changes to Figure 6 of the original article. Secondary benefits of this arrangement include the option of using an existing 12 V power supply to provide the operating voltage, and the ability to use an additional conductor to carry power to an antenna-mounted preamplifier.